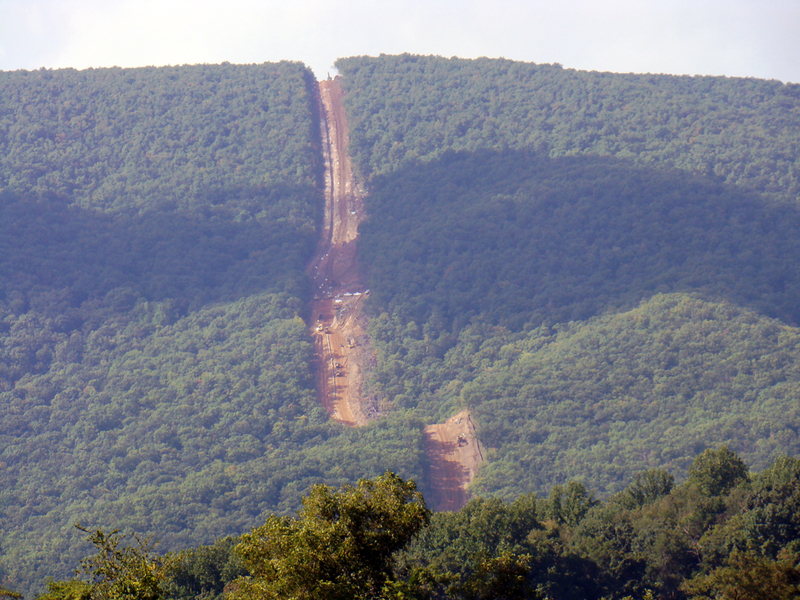 The Dominion Pipeline Monitoring Coalition has submitted a complaint and request for enforcement to the Virginia DEQ concerning non-compliance with Virginia erosion and sediment control and stormwater management requirements at the Columbia Gas of Virginia (CGV) pipeline construction project on Peters Mountain in Giles County. CGV failed to prepare and adhere to a compliant erosion and sediment control plan, failed to prepare a stormwater management plan, and created a discharge that contaminated a public water supply system. The DPMC has joined with other groups and multiple counties who are asking state government officials to ensure that the DEQ has the resources and commitment needed to provide effective oversight of pipeline construction projects. Our complaint concerning the CGV project provides an opportunity for the DEQ to demonstrate that it can meet its responsibilities for enforcement of environmental laws and regulations. 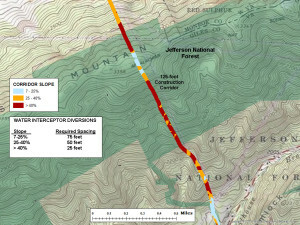 This is a complaint and request for enforcement filed on behalf of the Dominion Pipeline Monitoring Coalition (DPMC) concerning non-compliance with Virginia erosion and sediment control and stormwater management requirements at the Columbia Gas of Virginia (CGV) pipeline construction project on Peters Mountain in Giles County. As described below, CGV has failed to prepare and adhere to a compliant erosion and sediment control plan, has failed to prepare a stormwater management plan, and has created a discharge that jeopardizes a public water supply. We therefore request that the DEQ require CGV to develop a complete stormwater pollution prevention plan (SWPPP), including compliant erosion and sediment control and stormwater management plans. We further request that the DEQ require CGV to immediately obtain an individual stormwater permit and install and maintain compliant erosion and sediment control and stormwater management structures. This CGV project reveals some of the problems we can expect when pipeline construction companies are essentially self-regulating and the responsible regulatory agencies are not meaningfully engaged in review or oversight. The CGV project involves replacement of an existing small pipeline with a larger 12-inch pipeline. The DPMC is alarmed by the potential for significant degradation of water resources if the currently proposed 42-inch Atlantic Coast and Mountain Valley pipelines are constructed across similar steep mountains and karst landscape. We have joined with other groups and multiple counties who are asking state government officials to ensure that the DEQ has the resources and commitment needed to provide effective oversight of pipeline construction projects. We are concerned that neither the DEQ nor the public will have an opportunity to review site-specific erosion and sediment control and stormwater management plans for the ACP and MVP in a meaningful timeframe prior to construction and project approvals. Our complaint concerning the CGV project provides an opportunity for the DEQ to demonstrate that it can meet its responsibilities for enforcement of environmental laws and regulations. Installation and maintenance of erosion and sediment control structures. Identification and protection of sensitive environmental features. Preservation of watershed hydrologic function. The attached Figure-17.pdf, included in two of the above-cited CGV documents, specifies that WID spacing will be based on slope steepness, with spacing requirements ranging from a maximum of 25 feet for slopes of greater than 40% to 100 feet for slopes of less than 7%. Observations and photos suggest that few if any compliant WIDs were present during the construction phase of the project, despite the fact that a large portion of the project area contains highly erodible soils and critical slopes. See attached photos: 2014_1.jpg and 2014_2.jpg. Both of these photos are of corridor sections on the eastern side of Peters Mountain where erodible surficial material is present and steep slopes are present. See attached map: Slope.jpg. We also observe that the construction diagrams included in the ESC plans depict a WID spacing of 100 feet throughout the project, which, even if the ESC plans had been followed, would have been non-compliant. 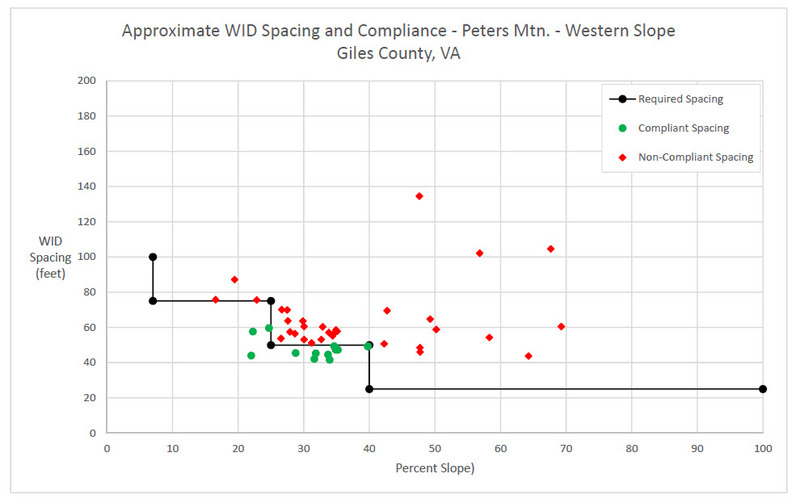 Based on aerial imagery and GIS analysis, we estimate that 72% of the WIDs presently in place on the Peters Mountain section of the designated-restored pipeline construction area exceed the spacing requirements. This is especially the case on the steeper sections and in the area above the slope failure that we brought to the attention of the DEQ on October 9, 2015. 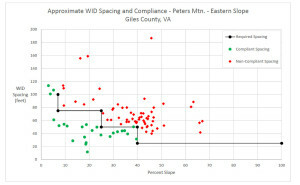 The attached graphics, WID_ 1.pdf and WID_ 2.pdf, indicate the high degree of non-compliant WID spacing among all slope classes and on both the western and eastern sides of Peters Mountain. In multiple locations the current WIDs are configured to divert runoff into ditches that channel water down the corridor slope rather than off of the corridor into adjacent vegetated areas as required. Note that one such diversion ditch channels runoff water into a sinkhole and public water-supply source, as described below. WIDs should be constructed or reconstructed to meet spacing requirements. Where WIDs and diversion ditches currently channel runoff down the corridor slope and mountainside, the WIDs and corridor should be reconstructed to channel runoff directly off of the corridor into vegetated areas. WIDs are intended to intercept runoff and direct it away from disturbed areas before it concentrates and flows downhill and contributes to erosion and sediment transport or slope failure. 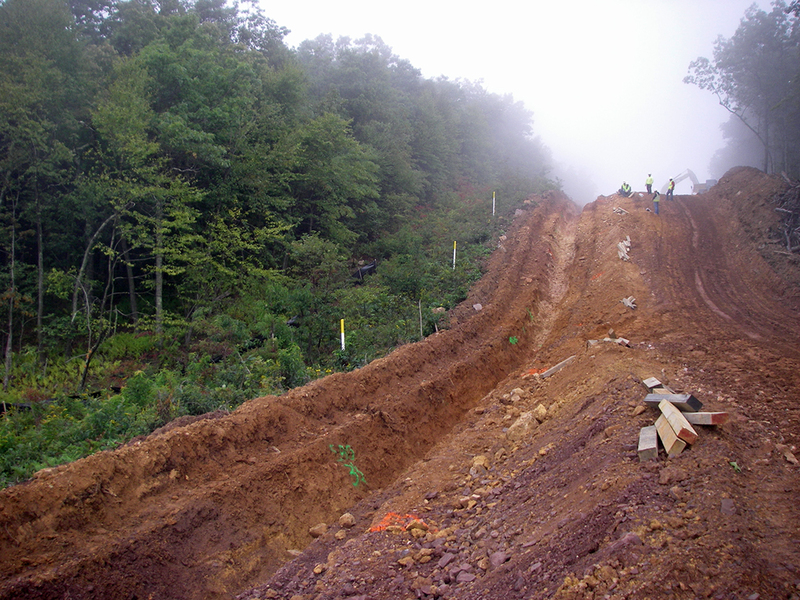 In September of 2014, during the construction phase of the project, a Forest Service representative visited the project and reported having “never seen as much sediment leaving a site before.” During the construction phase of the project, CGV was essentially self-regulated and all ESC inspections were conducted by company contractors. The DEQ did not review the ESC plans for the project prior to or during construction, and it conducted no inspections during construction. The proposed ACP and the MVP projects will both cross difficult steep mountain topography on a scale that far exceeds that of the CGV project. The water resource problems that inevitably result from self-regulation and acceptance of relaxed standards will be greatly magnified. The DEQ will not meet its regulatory obligations if it fails to review ESC plans, fails to conduct site inspections throughout construction, and allows deviation from standard ESC specifications. CGV failed to identify the presence of a documented sinkhole complex adjacent the construction corridor at the foot of the western side of Peters Mountain. 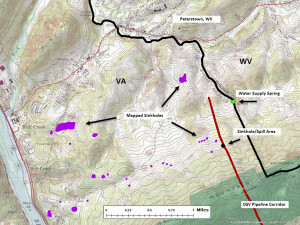 The presence of karst and sinkholes in this area is well known and has been map-documented by the Virginia Department of Mines, Minerals, and Energy. Appropriate diligence on the part of either CGV or the DEQ may have avoided subsequent problems. As noted above, however, the DEQ failed to obtain or review erosion and sediment control or stormwater management plans for this pipeline project prior to construction. Thus the DEQ did not identify potential sinkhole problems. Beginning on July 7, 2015, the water treatment plant maintained in Peterstown, West Virginia by the Red Sulphur Public Service District (PSD) was taken out-of-service for a period of two and one-half weeks due to diesel fuel or other petrochemical contamination associated with equipment on the pipeline construction site. When the incident occurred there was a smell of diesel at the treatment plant and in the tap water of customers. As indicated in reports obtained from the DEQ, the “only definitive source discovered” was an equipment-staging area adjacent to a “spring source head.” The spring source in question is a sinkhole approximately one-half-mile away from a resurgence that serves as the primary water source for the PSD water treatment plant in Peterstown. The treatment plant provides water for about 4,000 consumers, including critical facilities (schools, nursing and assisted living facilities, and medical facilities). During the lapse, the PSD obtained water on an emergency basis from Giles County. The total cost to the PSD for the incident was around $43,000 (Based on personal communication with Porter Robertson, water treatment plant operator for the Red Sulphur Public Service District, 10/28/15.). The attached set of documents, Contamination.zip, includes information exchanged between the DEQ and CGV officials concerning the incident, including a photographic summary report, an aerial image showing the location of the diesel spill and the PSD water supply spring, and an analysis and initial abatement report prepared by a CGV contractor. As reported in the initial abatement report, 26 55-gallon drums of contaminated soil from two “identified spill areas” within an equipment staging area next to the pipeline right-of-way were collected and removed from the site. 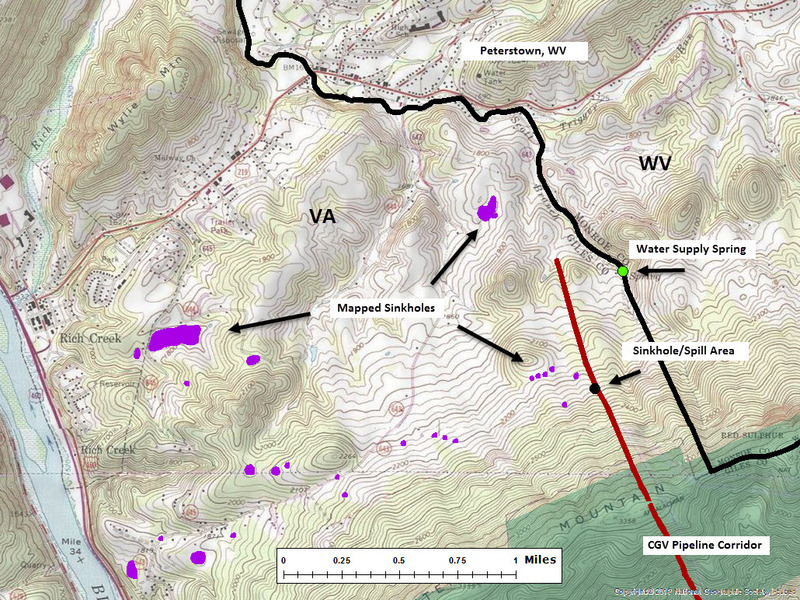 The attached map, Karst.jpg, shows the location of the CGV pipeline corridor, the water supply spring for the Red Sulphur PSD, the sinkhole associated with the contamination incident, and the location of mapped sinkholes in the area. Note that there are six mapped sinkholes within 450 meters of the sinkhole associated with the contamination incident. The contamination of the Red Sulphur PSD system with diesel fuel is compounded by evident non-compliance with erosion and sediment control requirements, including CGV’s standards and specifications and ESC plans. As indicated above, properly designed WIDs direct runoff away from the construction corridor into adjacent vegetated areas. 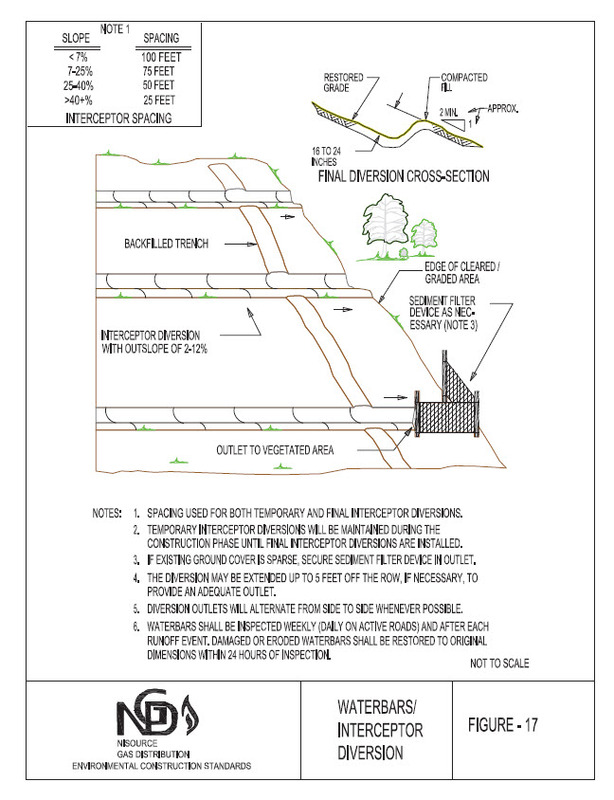 Instead, the WIDs on the CGV corridor in the area above the sinkhole channel runoff into a diversion ditch on the edge of the corridor that receives runoff from multiple WIDs and directs this runoff into the sinkhole at the bottom of the slope. 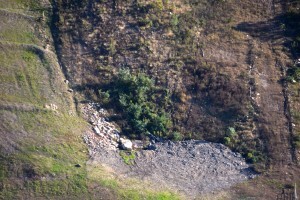 The attached aerial photograph, Sinkhole.jpg, obtained on October 18, 2015, shows the corridor area on the western side of Peters Mountain above the sinkhole, including the diversion ditch that channels runoff from the WIDs to the sinkhole. The attached page, ESC_Excerpt.jpg, from CGV’s ESC Plan depicts the locations of WIDs in the same area that is shown in the aerial photo. The indicated WIDs depict channeling of runoff away from the corridor and not into a ditch along the edge of the corridor. 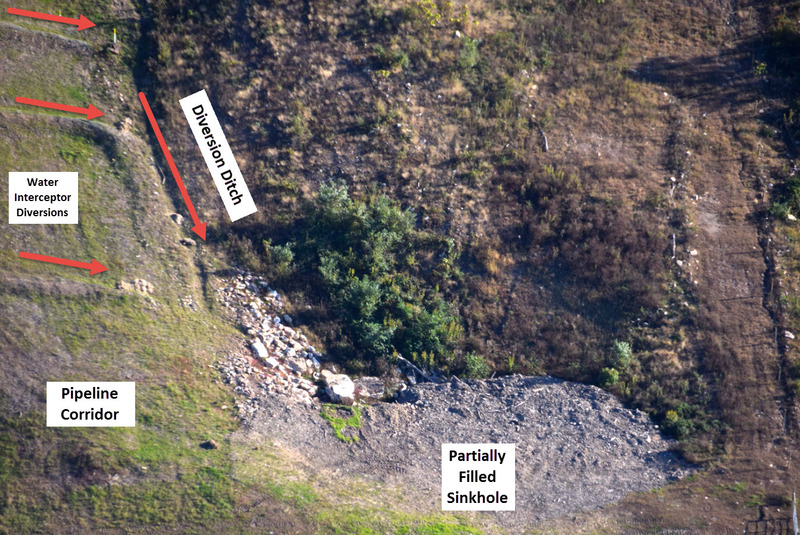 The plan does not show the sinkhole that receives the discharge from the ditch. The discharge of pipeline construction corridor runoff into a sinkhole connected to a public water supply should be treated as a public health emergency. CGV should be required to immediately obtain and comply with an individual permit for stormwater discharge and to reconstruct the corridor and WIDs to properly channel runoff directly off of the corridor into vegetated areas where there is no chance of discharge into the sinkhole. The failure of both the pipeline construction company and the DEQ to identify and protect a sinkhole connected to a public water supply reinforces the perspective that pipeline companies cannot be relied upon for self-regulation, and that unless there are fundamental changes in DEQ direction and commitment, the agency cannot be relied upon to provide the level of review and oversight needed to protect critical water resources from degradation associated with pipeline construction. The effectiveness of DEQ compliance enforcement is called into question by DEQ’s failure to undertake enforcement action beyond requiring the company involved in this case to simply clean up the spill. The DEQ, moreover, seemingly intends to allow continuation of stormwater discharge into the sinkhole, despite the fact that it is directly connected to a public water supply. The systemic deficiencies revealed in this case will inevitably lead to much greater problems if the proposed ACP and MVP projects go forward on the same poorly regulated basis. Both pipelines will cross similar karst terrain, including public water supply recharge areas, though on a much larger scale and over a much larger geographic area than the CGV project. Both companies have already failed to demonstrate the type of accountability and transparency in addressing these types of issues that is fundamental to public trust. The MVP would actually cross additional water supply recharge areas that serve the Red Sulphur PSD. The stormwater pollution prevention plan (SWPPP) is deficient in many aspects. There is no stormwater management plan delineated in the SWPPP, and required calculations to support critical engineering conclusions are missing. Upon completion of the project, the increase in runoff from the easement will be negligible and stormwater controls will not be required. CGV provided no basis for the determination of the before-construction value, and no justification for assuming it will be the same post-construction. Although CGV recognized soil instability and steep slopes as construction issues, it failed to analyze these as problems that require real and adequate solutions. As described above and in our correspondence with DEQ on October 9, 2015, our surveillance shows that post-construction runoff is, and has been, causing soil erosion and slope failure in the construction zone. Similar observations are made in CGV and DEQ inspection reports. In addition, as described above, a diversion ditch continues to channel construction area runoff into a sinkhole. Discharge into this sinkhole can be traced to well-documented pollution of the public water supply for Peterstown, West Virginia. The continuing discharge of uncontrolled stormwater from the construction corridor requires regulation under an individual stormwater permit. The permit must include a description of best management practices to be installed and supporting calculations to demonstrate that stormwater runoff properties will not be altered by the construction. The DEQ’s failure to review permit application material and stormwater management plans for compliance reinforces the perspective that the agency cannot be relied upon to provide the regulatory oversight needed to protect water resources from degradation due to pipeline construction. Virginia faces pipeline construction on an unprecedented scale and in a difficult and sensitive environment. Stormwater management requirements are applied to other construction projects throughout the state. The DEQ must demonstrate a commitment to implementation of the same stormwater management requirements for pipeline construction projects. We look forward to your speedy response to our complaint concerning these important matters. This entry was posted in Environmental Review, Erosion and Sediment Control, Regulatory Compliance, Water Supply Impact by Rick Webb. Bookmark the permalink. 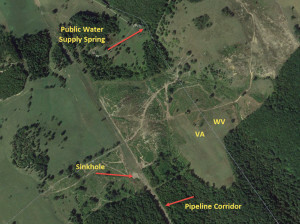 In July 2015 the public water treatment system for Peterstown, West Virginia was taken off-line for two and one-half weeks after diesel fuel was spilled near this sinkhole. Contractors working for Columbia Gas of Virginia removed 26 55-gallon drums of contaminated soil. 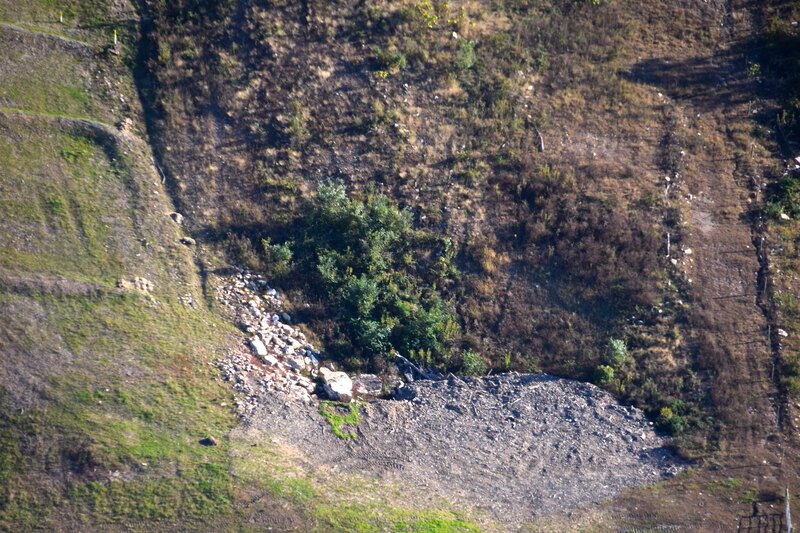 The above photo was obtained by the Pipeline Air Force in October 2015. At that time, drainage structures on the pipeline corridor were configured to discharge runoff to the sinkhole. Pipeline corridor, sinkhole complex, and Red Sulphur PSD water supply spring. 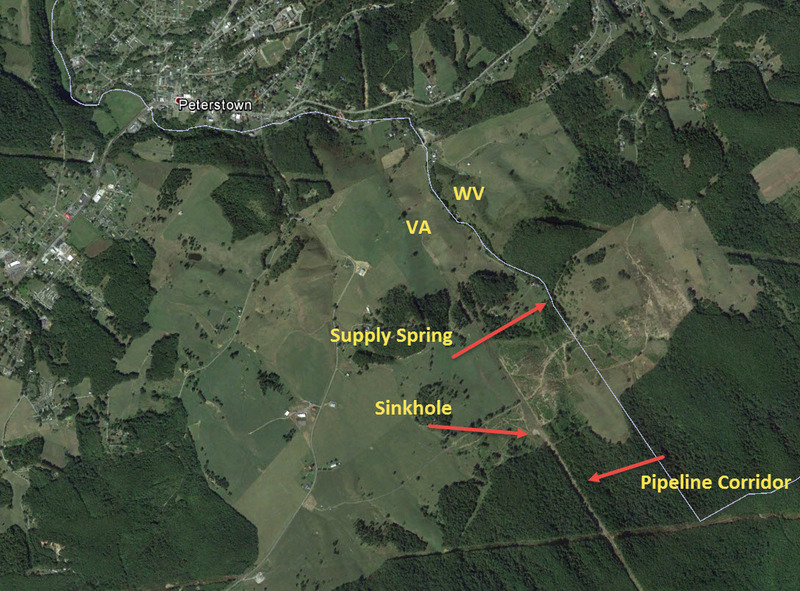 Sinkhole mapping was obtained from the Virginia Department of Mines, Minerals, and Energy (Virginia only). 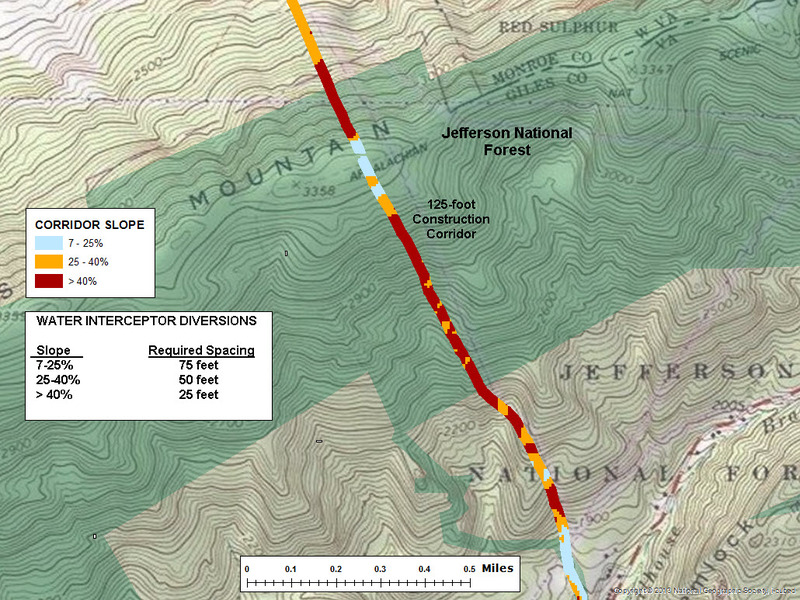 Slope classification for the Columbia Gas pipeline corridor on Peters Mountain. The required spacing for Water Interceptor Diversions (WIDs) is based on slope. Closer spacing is required on steeper slopes. 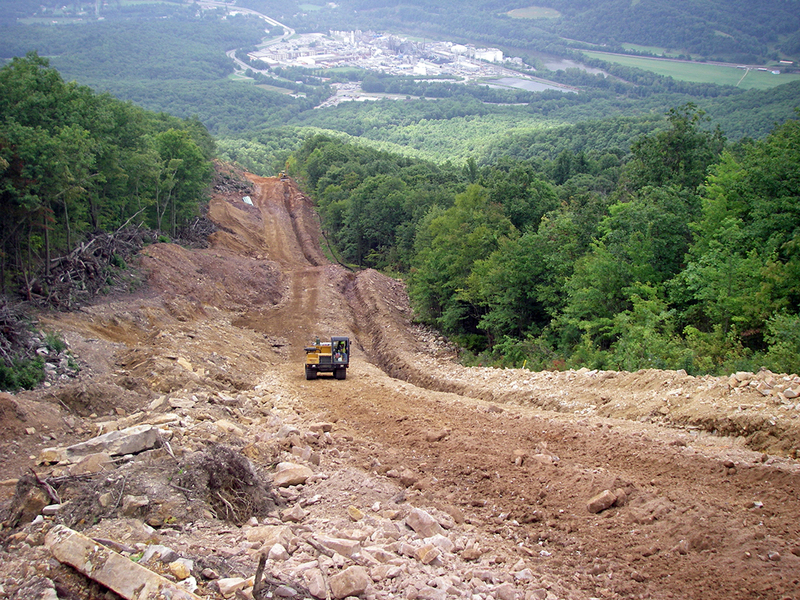 Eastern slope of Peters Mountain during pipeline construction (September 2014). The WIDs depicted in CGV's erosion and sediment control plans are not evident on the ground. 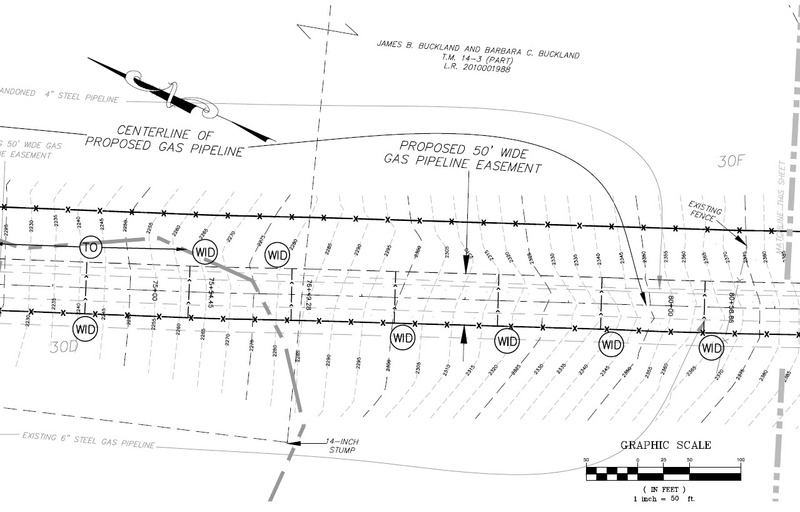 This project involved installation of a 12-inch pipeline in an existing pipeline right-of-way. The corridor is about 75-feet wide. Although the DEQ is the regulatory agency responsible for oversight of pipeline construction in Virginia, the DEQ did not review erosion and sediment control plans for the CGV project before construction or conduct inspections during construction. This is routine for pipeline construction projects. The DEQ's most significant regulatory decision related to the CGV project was approval of a variance request for open trench limits. Virginia's minimum standards restrict open trenches to 500 feet at any one time. The DEQ granted a variance allowing open trenches of 1000 and 2000 feet on this very steep mountain. The DEQ routinely grants similar, or more-extreme, variances for pipeline construction projects. 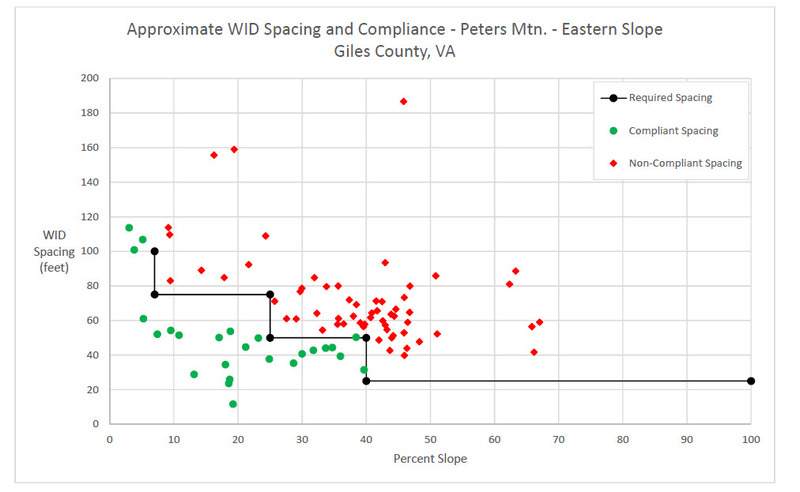 Compliance analysis for WID spacing: eastern slope of Peters Mountain, post-construction. 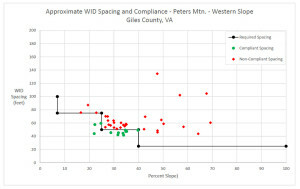 Compliance analysis for WID spacing: western slope of Peters Mountain, post-construction.